I finished the third sewing box this morning. So, the random number generator came up with these three numbers. Congratulations ladies! 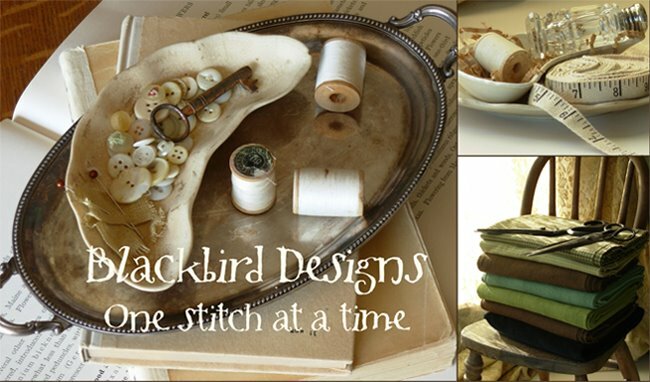 E-mail me at alma@blackbird-designs.com and I will send out your prize. It's been cool and cloudy here. I'm wishing for better light for photography. I feel like all of the pictures I'm taking are in the dark. Tomorrow it will be sunny and warm up a bit. I'm planning to ride my bike as I can tell I need a bit of exercise and nothing better than riding a bike! At quilt market, a woman from California talked to me about her garden. She said she canned everything. 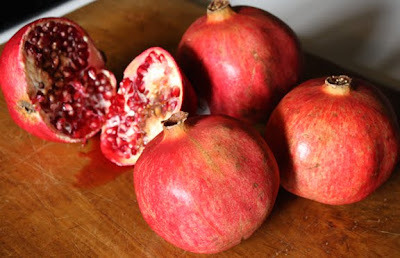 When she returned home, she planned to pick pomegranates from her trees in her yard. She makes Pomegranate Jelly every year. 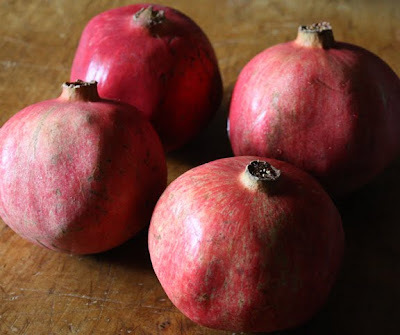 After her conversation, I couldn't get the image of the lovely color of pomegranate seeds out of my mind. I found 4 at the grocery store last night and just had to buy them. I do feel a bit guilty though. Anything with that many seeds is really serious about reproduction! I manually removed the seeds from the pulp. I know there are various methods to do this ....but they seem to easily fall away from the pulp with a bit of pressure from my fingers. The above picture illustrates the number of seeds from 3 pomegranates. I did use all of the seeds from 4. You need 3 3/4 cups of juice. I didn't have quite enough so added water to make up the difference. I juiced a couple of lemons and added 1/2 cup of lemon juice. I always add a tsp. of butter to reduce the foaming when making jelly. 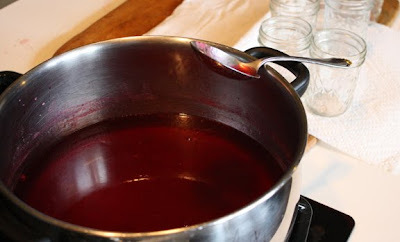 I added 1 package powdered pectin to the juice and brought to a boil. I then added 5 cups of sugar and brought the mixture to a rolling boil again. I let it boil for a minute and then poured it into the glass jars. I wash the jars in the dish washer and remove them while they are still hot. The jelly is in the jars and the tops and rings are in place. 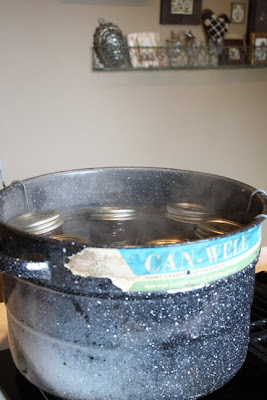 I place them in this old canner. I lower the jars until they are covered completed by boiling water. The lid is placed on the canner and they boil for about 7 minutes. After the process is completed I take them out and let them cool. Check the seals, the lids should be sucked down (you'll hear a popping noise as the jelly cools). I can't wait to taste. While the jelly is in the canner, I scrape up enough jelly left in the pan to have a taste. I rate this breakfast worthy! The lemon juice lends a bit of tartness. Love the color and sweet flavor. Barb uses her pomegranates a bit differently. 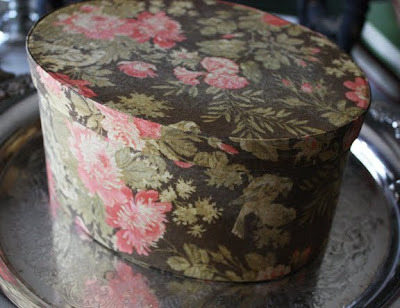 Here's a picture of her latest pattern we released at market. So many ways to celebrate this wonderful fruit. 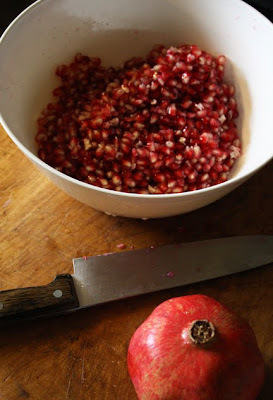 Pomegranates are in season September through February. In the states, California and Arizona seem to grow the most. So now is the time to get yours! If you plan to quilt your pomegranates, Barb used the fabric line from Old Primrose Inn. It should be in your quilt stores in the next couple of weeks. I LOVE this quilt!!! Gorgeous! Can't wait to see this in the shops! Alma...Is there anything that you don't do? Where do you find all the hours in the day for all your activities and projects? I can see that I would be very intimidated by a pomegranate! That pomemgranet jelly and the quilt are both lovely. Congrats to the winners! To the three winners............congrats. Aren't those pomegranates messy little things? Love the quilt. Congrats to the lucky, lucky winners! I agree, where do you find all the energy and time!?!? Someone just told me to look, I haven't done my blog hopping tonight. I am so thrilled to have won, I am sick with a bad flu and it really perked up my day! I love pomegranates, and that jelly looks good. Here, apples are in season and I love cooking with them. Beautiful quilt and jelly! Yummers! The color alone would be a fine reason for making this wonderful jelly, wouldn't it? Just gorgeous! As a cross titcher ,I have a question for you: are there any news about the stocking series and the new Loose feather? I love them all. Congrats to the contest winners! The jelly looks beautiful and delicious and the quilt - well, what's not to love about that beauty!? 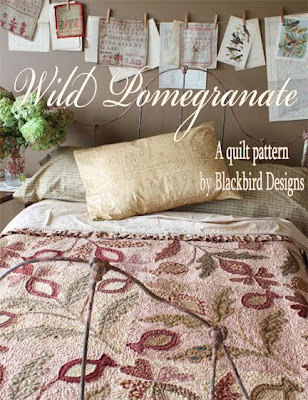 I love the Pomegranate quilt! I'm getting ready to order and wish I had the fabric requirements for it. Did you use your new line (Old Primrose Inn) for it? Also, I thought I heard that you both were working on an Autumn Book? Is this true and when can we expect the next book? I just gathered up all of my cross stitch patterns today that I have kitted up already to stitch, but I still look forward to seeing what you two come up with for us next. I laughted out loud at what you said about pomegranite seeds, lol! So true! I love poms, and they are so good for us too! The jelly you made looks wonderful! Have never eaten a pomegranate in my life!!! Dont know if Im allergic to them.. so I am to chicken to try..:o) But I can make a quilt .. cant I??? Loved the quilt and the fabrics used are sooo pretty!!! Your pomegranate jelly is so pretty. Sure wish you lived closer as I have a whole tree full of pomegranates in my backyard this year and I'd love to give you a bushel full. 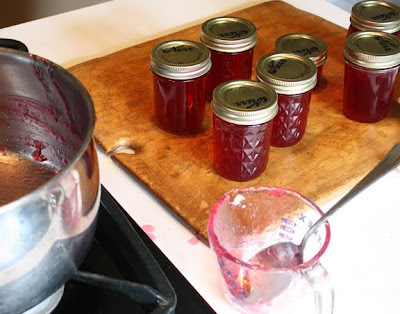 Hubby and I made jelly just one time years ago and it was so hard to get all the seeds out that we haven't tried it since. I love to decorate with them for the holidays. Just love your new quilt patterns! I love stitch and quilt almost beautiful colours. I am enjoy to read your blogs that very interesting. Trish. Australia. Lucky are the winners - Congratulations!!!! oooh, I wanna try your pom jelly! It looks so tasty. Oh this is such a beautiful quilt! I am still working on my Halloween 1904 :) I can make them all can't I? Sew-sew-sew! this is so adorable - is this frayed edge applique...so cozy looking love it! 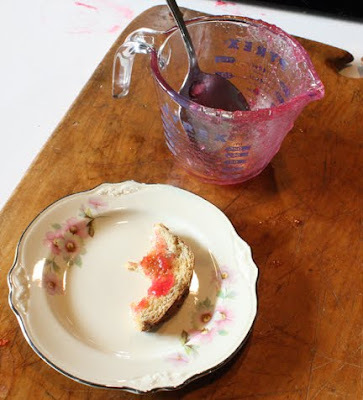 I made pomegranate jelly this summer too! I found an easy way to get the seeds out, let me know if you want my trick!